This was a new change of pace for the Western lord, here he was walking throughout the North but of course he walked through the North only due to Rin wanting to come here and see some kind of tree that came to life with color. Sesshomaru didn't let any emotions show on his face, he just sat under the tree watching Rin and Jaken who were busy looking at the trees which were budding pink flowers. Due to it being summer, many trees were awaking at different paces. Amber eyes were closed as he sat there with his two headed dragon Ah-un, this wasn't his lands but he didn't care since Rin wanted to see the sights not that the imp wanted too. Jaken and Rin were to different for they talked about stuff and said different things to certain subjects, Sesshomaru never took part in those conversations for they were all to bothersome. Rin happened to happily laugh running as a flower fell from a tree and she looked at it happily, Jaken on the other hand wasn't amused by such a small flower. Sesshomaru and Ah-un were under the shade of one of the trees just relaxing for a short while. He ran, he walked, he sprinted, he dragged his feet, but the only sight around him was green and green and green. Leaved and small branched kept tugging at his clothes and hair continuously, as if they were trying to make him stop and stay in a certain position forever. Such an unusual feeling, being persuaded by mere nature elements, he had never felt before in his life. He had started to loose his sense of time. He couldn't recall if it was morning or night when he had first entered this vast and endless forest. The dense foliage above him didn't help much with the task either. He found himself leaving a dreadful sigh as he stopped for a minute to look around for a possible exit to this shady green mess. Hi features took a delighted expression when he noticed a small light opening through a bush right up ahead of him. Taking in an encouraging breath, he started his hopeful march towards the possible exit and pushed himself through the leaves quickly. A moment of silence passed by and it was actually nice to Sesshomaru who always had to work in his office, he could get use to letting Rin choose the sights for a while. After all, it did bring a new feeling over him which almost made him sleepy. Not that the Western lord would admit it. 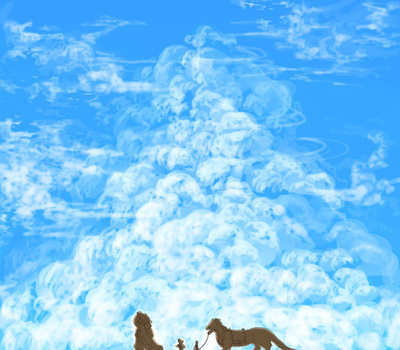 Jaken frowned to Rin as she picked up the small flower, of course the little human child noticed a figure distantly away and she smiled curiously. Jaken on the other hand froze as he stood next to the human child. Rin was a innocent child, she never really looked at anyone as dangerous unless they attacked her. Jaken wanted to say something to wake up his master but he still was unsure on if this fellow was nice or not. Ah-un lifted his two heads for a moment to look around before lowering his head back down. Rin couldn't help but do a shy wave toward the man she could see but ever so distantly, Jaken on the other hand looked to Rin and tried to make her stop waving. For a moment there, he just had to stay still and quiet, trying to figure out if the group was a threat. The concern over the strong demon aura they gave off though was dropped when his eyes met the little girl waving at him. Oh, he was sure that little being was human to the core. It had been some time since he last saw a human child standing so close to him. How beautiful and fragile things they were. He couldn't help but smile lightly at her for a bit, before going into a full grin similar to his previous one, waving back at her joyfully. He didn't give it much thought as he started a steady walk towards them. In the worst scenario, the man sleeping under the tree would be an evil demon who would attack him when he approached further more. He could handle a demon though. He had done it before. "I hope I'm not intruding, little lady~"
Hi grin had become a light warm smile again as he lowered down to his knees in front of the girl so as to be able to look at her in the eyes. The creature next to her seemed to be a yokai too. What was a little girl like her doing with such a company beside her? Rin's face became cheerful as she saw that he was nice and actually approached her, as he kneeled down to her did she laugh with her eyes closed. Jaken was stunned and then he looked to the side mumbling about this guy who had approached them. Rin couldn't help but show him her flower she had gotten. "Of course not! I like meeting new people! Do you like this flower? ", she couldn't help but look to the small flower in hand and then back at him. Jaken couldn't help but wander away from Rin though he didn't go to far. Sesshomaru picked up a scent and opened his eyes silently seeing someone talking to Rin. Not once did he move however, it was as if he was debating if he was a threat or not. Ah-un remained where he was, lightly close to his master but behind the tree and perfectly under the shade. Such a cute little girl she was indeed. He looked down at the flower in the girl's hands for a moment, before taking both that and her hands in his and raising to the level of his nose, taking a slight sniff at the fragrance. A small wave of air escaped his mouth as he opened his previously closed eyes. "It's beautiful; like you, little lady." His lips widened into a more reassuring smile as he let go of the girl's hands. He took a quick look at his side, only to find the yokai lord still laying down composed. The mount-like yokai was right next to him in a very similar state, whereas the other yokai had left the girl's side a while ago. The group sure was laid back. It was an odd group and he had noticed that from the time they came into view. Not that it was his business to step into their affairs, but he couldn't halt his curiosity. He rarely saw humans travel alongside yokai. Especially letting their children approach them. Or did she not have human origins waiting for her back home? "May I ask what this little lady is doing with such an unusual company?" For a minute, even with the eyes of a supernatural being, the dragon demon seemed more human than one like him could ever be. He had attained this certain ability over time. His whole life as he remembers it was always full of human beings and their behavior. Their fragile and small lives attracted him more than any yokai ever would. Their scent tended to overtake him at times. Rin blinked and she purely laughed while her face went a little red to the compliment. "Thank you! My name is Rin! ", she couldn't help but laugh a little bit before looking to the flower and she did the same as he did by putting it to her nose and taking a small sniff of it. Rin's nose went up after she had smelled the small flower and she couldn't help but like the smell of it. Hearing his question however made Rin tilt her head and then she giggled pointing to Jaken which the imp froze again. "I don't mind sharing with you! That is Master Jaken, over there is Lord Sesshomaru, and the two headed dragon there is Ah-un! I find him so funny sometimes. ", Rin laughed and turned to see Sesshomaru awake which made her smile. "I made a friend, Sesshomaru-sama! ", Jaken looked to his master for a moment and all that Sesshomaru did was nod silently before looking upward to the sky. Rin wasn't in harm and so Sesshomaru took that as a chance to take it easy for a moment longer. 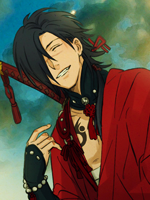 Ah-un heard his name called and all the dragon did was make a soft groan behind the trees in response to Rin. Rin couldn't help but be as happy as the sun looking up to her new friend. His head tilted slightly when the demon lord's name was mention. Sesshomaru. He was sure he had heard that name before, although he had never in his presence before. He gazed over at him for a bit, returning his eyes to the girl a moment after. His smile couldn't get off his face. He had made yet another human friend and he was as happy and delightful as the girl's face in front of him. Since the rest of the demons around didn't seem to be hostile towards him, he relaxed a bit more and thought of something to pass the time with his new friend. "Rin then~ Do you want to play a game, Rin?" His voice sounded a bit younger than his appearance, but so did his face and his actions. He just shifted into a complete child entertainer when he was around human kids. Heck, he could even become a clown if it meant they would laugh happily. Rin's face became happy as she thought about what kind of game to play, never was the imp good at playing with her since he complained about it alot. Never did the human child ask Sesshomaru to play with her since he was busy, and Ah-un was but a two headed dragon and couldn't really play with her either. Rin only played by herself doing simple things like picking flowers or looking for something to eat, after a moment did she think of a game and softly she touched his leg and skipped off happily. "You are it!". Jaken blinked shocked at this and couldn't help but mumble to himself again, the imp had never seen such a pathetic game before. Sesshomaru didn't actually care for if Rin was having fun then that was all that mattered to him, as long as she was fine that is all that he cared about. Ah-un went back to laying his heads down and actually decided to go back to sleep. And there it was; his childish spirit rising from within him. Just a few seconds were enough to change his calm smile into a cheerful grin. With the touch and the words, he was up and running behind the little girl in an instant. He kept a low pace as to not catch up to her quickly. It was more fun the longer it lasted. He was completely aware that he was in the presence of three more yokai, but still he ignored the fact and just continued his childish behavior. After some time of running around, he tagged at Rin's kimono and gave her a playful wink before confirming her turn to be it. Rin blinked and laughed as she was caught, a happy smile came to her face as she turned swiftly around and tried to return the favor in catching him. Jaken shook his head, never would he understand human children. They were so easily amused by every little thing. Sesshomaru watched them silently, or rather he got tired of watching the sky and decided to watch Rin and her new friend have fun. 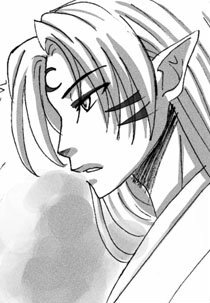 Jaken walked over to his master with a questioning look, Sesshomaru did not seem to notice the imp's face which meant that Jaken was being ignored. Jaken sighed to himself with his eyes closed and walked over to Ah-un who lifted his head when the imp had approached. Jaken took seat near the two headed dragon who now placed his heads back to the ground. "I'm going to get you! ", Rin laughed happily.